A servicing workshop and demarcated area where customers can be measured to have their bicycle fitted. The This Way Out app,which gives users access to services like booking bikes in for a service online, seeing when upcoming events will take place, shopping online, etc. Customers can have a coffee or drink from the in-store bar, which they can enjoy at seating areas conveniently located on the shop floor. This Way Out has taken the outdoor shopping experience to a new level: they have created retail spaces that encourage customers to hang around and enjoy the shopping experience. Or simply pop in for a visit or to have a drink with friends. Their latest store at 16 Buiten Street, Cape Town, is the third of its kind, following the opening of the Meerendal and Contermanskloof outlets earlier this year. 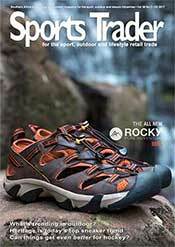 The stores showcase top cycling, biking and outdoor brands like Helly Hansen, Easton, Northwave, Rocky Mountain, Raceface, Alpine Stars, Evoc and many more. 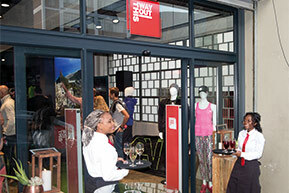 This Way Out store is, however, more than just a brand concept store: it will kit out patrons for their chosen activity through to the next activity, even if it is just for a braai, visit to a wine farm or to hang out with friends. In welcoming guests, owner Abrie Botma explained his vision for the store, which he describes as “an indoor space for outside beings”. The aim is to be an enabler or portal for people to be kitted out for the great outdoors — whether in the form of cycling, yachting, mountain biking, etc. The company and its employees live by the Helly Hanson brand’s motto: “Born by the ocean, raised by the mountain,” says Botma. “We love anything that’s on water, land, on mountains…we’ve hiked most things, climbed most things and drank a lot of wine in between,” he joked. Some features that make a difference to the shopping experience include a coffee and drink bar, where customers can order drinks or coffee while they contemplate purchases, a conference room that will be used for staff meetings, a servicing workshop and demarcated area where customers can be measured to have their bicycle fitted. A This Way Out app is also available and gives users access to a variety of services including booking bikes in for a service online, seeing when upcoming events will take place, shopping online, booking private merchandising sessions and users can even join a coffee loyalty programme to receive discount on coffees from their in-store coffee counter/bar. Adventurer Riaan Manser and his partner Vasti Geldenhuys were two of the speakers at the store opening and gave guests a bit of a peak into the adventures they have had, which included tales of Manser cycling the perimeter of Africa and their 10 765km rowing journey to New York.